"Cream of mushroom soup together with sour cream, corn, and Parmesan to coat chicken breasts served on your choice of pasta or rice. This recipe is for 4 adult servings with no leftovers. Use your own instincts to add a little of what you like. But stick closely to the recipe, it's worth it. You can substitute peas for the corn. Enjoy!" Heat oil in a large skillet over medium-high heat. Saute onion and garlic in hot oil until slightly softened and fragrant, about 3 minutes. Add chicken pieces; season with salt, white pepper, and black pepper. Cook and stir chicken until no longer pink in the middle, 7 to 10 minutes; transfer to an 8-inch square baking dish. Stir condensed soup, mayonnaise, Parmesan cheese, corn, sour cream, and milk together in a bowl; pour over chicken in the baking dish. 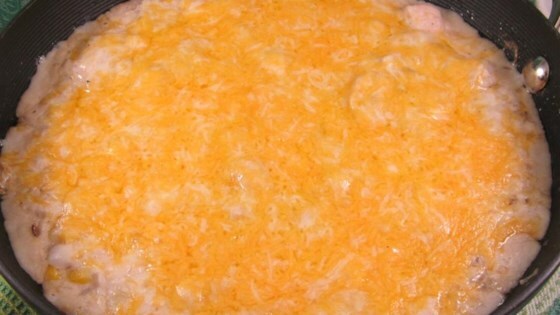 Sprinkle Cheddar cheese over the top. Bake in the preheated oven until bubbling and cheese is melted, about 20 minutes. Let rest for 5 minutes before serving. I love the simplicity of this recipe, and it is a good, basic chicken dish, but when the family mixed it in with the rice pilaf I made, they loved it. I used peas, added cream cheese for the cheddar and put slices of Colby jack on the top. It was delicious! Definite comfort food for a cold winter meal. Very rich. Good recipe, I didn't have frozen peas, so used frozen vegetables. Will make again!